In the competitive world of commercial real estate, brokers become frustrated when they feel like they are leaving their hard-earned money on the table due to non-competitive compensation. Today, there are rarely incentives to share information and fees with fellow brokers and Advisors. This results in reduced demand for properties, below-market sales and ultimately, lower commissions. 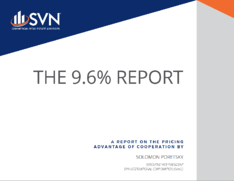 Download our 9.6% Report white paper to learn why SVN® Advisors believe in the benefits that a cooperative model has to offer. Learn how you, too, can start improving your overall efficiency and stop leaving dollars on the table. Why properties don't sell for their full values. How compensated cooperation improves commissions across the board. How to move inventory faster and at higher prices.